Click the button below to add the SPIDER GIRL! Size AM Only. 1 Left. Ships Next Business Day! Girls' Gymnastics Leotard Red & Blue: FREE SHIPPING and Free Scrunchie!!! to your wish list. 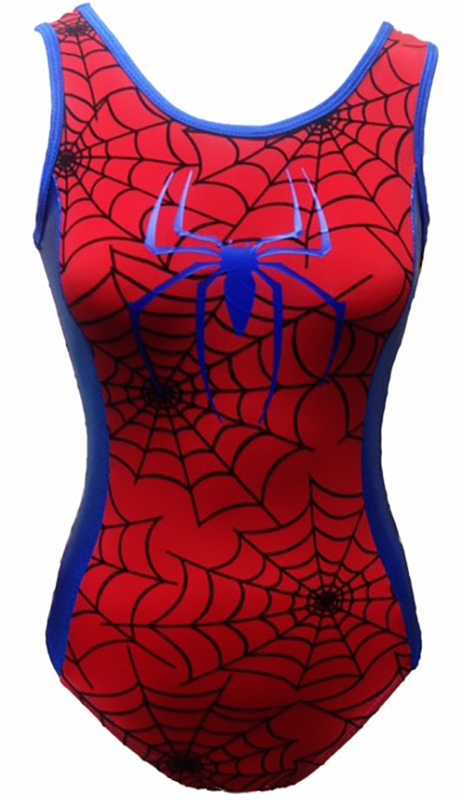 The Spider Girl gymnastics leotard is here! Just in time to save the day. This amazing, crime-fighting gymnastics leotard is designed to dazzle, and will certainly turn heads at the gym and on the podium. This one-of-a-kind gymnastics leotard is designed to the highest quality and performance standards. Each leotard provides exceptional comfort and durability. Every genuine Spider Girl gymnastics leotard is hand-sewn in the USA from the finest mystique nylon spandex 4-way stretch material. The eye-catching design of this brilliant leotard will give every champion gymnast an unbeatable combination of confidence, comfort and style at any meet or workout. Great for special gym shows, camps and theme days. Also makes a perfect gift. Order your Spider Girl gymnastics leotard today! Size AM Only. In Stock. Ships Next Business Day! CLICK HERE FOR SIZE CHART prior to ordering to confirm size needed. This will help avoid the need for exchanges and save you money on return shipping! NOTE: Size AL sizes are not returnable/exchangeable. Blue and Red Nylon/Spandex fabric with 4-way stretch.